Thanks to Conor Curran (cjcurran) on Launchpad, currently the only way to get rhythmbox to use a new Lame preset, is to first create the preset. 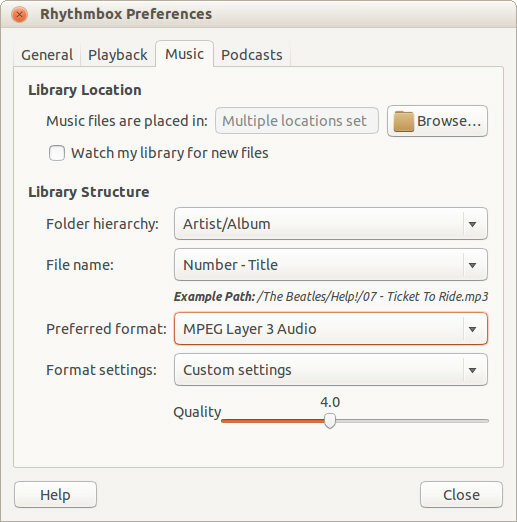 Conor thoughtfully provides an MP3 encoding preset to be used for Ubuntu 12.10 (242 bytes, text/plain), which does work in 11.10 and 12.04. If you drop this preset file in ~/.gstreamer-1.0/presets/GstLameMP3Enc.prs, that's half the job done. The proposal is to ship the preset in 13.04 so it ends up /usr/share/gstreamer-0.10/presets/ and reference it's name in the rhythmbox.gep. There is also an updated rhythmbox.gep file which references this preset. While this is no replacement for the semi-GUI interface we had before (you still had to enter a text string for the settings, remember), changing presets is as easy as editing a text file. It looks like it should be version specific, but you can change the preset name "12:04-default" to anything you want in both the .gep file and .prs, it doesn't really matter what, I went with "MP3-high" (no quotes). That stops Rhythmbox from complaining about a missing decoder. However, you might go for target =Bitrate to get a constant bit rate file. It wasn't clear from your posting how Sound Juicer gets the profiles that it uses. Does it use the same system as rhythmbox? In other words, if I setup a rhythmbox GEP file and the .prs file, and then use Sound Juicer to rip a CD, will it use this profile? Sound-Juicer uses its own GEP file. You will need to edit this too.